With such a low level of prices, one might think beer companies are not making much profits. However, in fact this is far from the truth. Let’s take a look at Saigon Beer (Saigon Beer Alcohol Beverage Corporation, aka SABECO) which belongs to the Ministry of Industry and Trade. 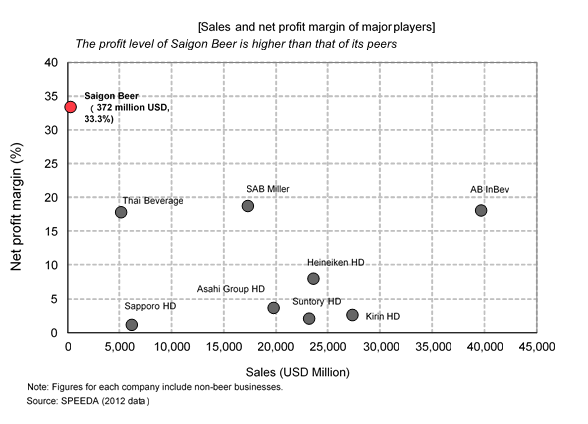 The following graph compares sales and net profit margin of Saigon Beer and major international beer players. 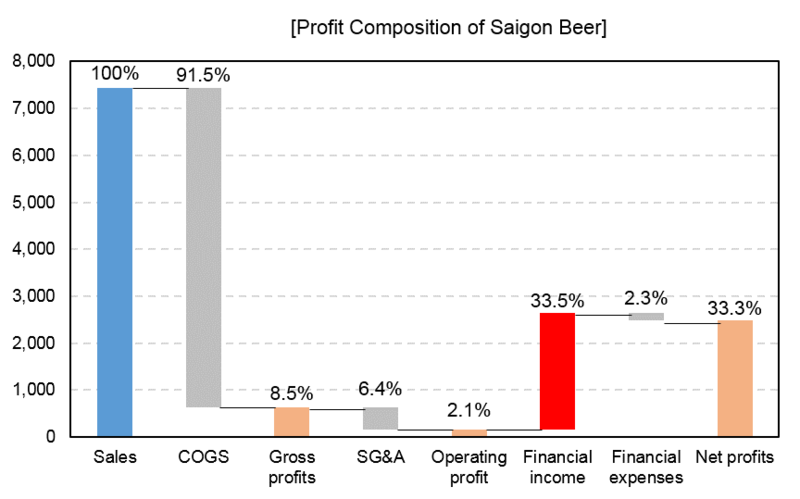 We see that compared to the major players, Saigon Beer’s net profit margin is extremely high. So can we conclude that the beer industry in Vietnam is profitable due to the high net profit margins above. In the chart below, we break down the composition of net profit. As you can see, Sabeco receives an enormous amount of financial income from bank savings and equity/debt investments in other companies. As such, Saigon beer is more of a financial company than a beer company. Note: figures inside brackets are percentages of sales. In many ASEAN countries, the equity and debt market is not well developed. In some countries, Chinese-origin and other zaibatsu groups (let’s collectively call them act as an intermediator, supporting the growth of companies and of the economy. However, in Vietnam such Chinese-origin financial system does not exist due to the strong grip of the communist party and the history of wars between China and Vietnam. It is in fact the state-owned enterprises (SOEs) which are taking over this role. Let’s call this the “Vietnamese financial system”. SOEs act as both the financial system and the foundation of the political system through the appointment of top executives by the government. In order to reform, incorporate and later on privatize Vietnamese SOEs, it is necessary to restructure Vietnam’s political and financial systems. We believe that it is a big challenge for Vietnam to reform its SOEs, because such reforms would require the restructuring of both financial and political system, a task that is both large in scale and complex in nature. However, as SOE reforms is part of Vietnam’s promises in TPP and other trade agreements, the government must progress with SOE reforms. In addition, Vietnam’s success in creating a healthy competitive environment will also lead to the improvement of the competitiveness of these companies which in turns converts to economic benefits for the consumers. There is much expectation for Vietnam to make use of lessons from countries which has experienced SOE reforms, such as Japan and ex-communist nations around the world.